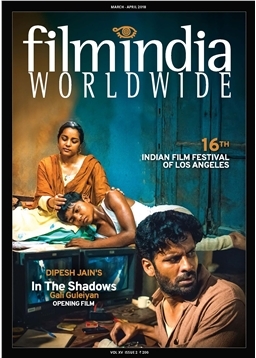 Highlighting the film festival landscape that does India proud, both abroad and within the country, the cover story is on the Indian Film Festival of Los Angeles. Now in its 16th year, IFFLA has become a beacon for India’s regional filmmakers to reach out to the US, that too, in the heart of Hollywood. This year it spotlights Dipesh Jain's debut feature ‘Gali Guleiyan’ (In The Shadows), a haunting Hindi language tale set in India, which has won accolades at leading festivals such as MAMI, Busan, Chicago, and elsewhere. In India, the Bengaluru International Film Festival, now in its tenth year, has grown by leaps and bounds, catering to an eager, abundant audience whose cyber-city skills give them a technical edge as cinephiles. Also in focus are the Indian entries at recent and upcoming festivals worldwide, noting awards and honours; the neglected Shorts and Docs scene, listing films that have made their name as well notable new ones; film professionals who have won recent honours; and the latest books on Indian cinema.